Delta Gamma was founded in 1873 based on the motto "Do Good." The founding members were Anna Boyd Ellington, Eva Webb Dodd and Mary Comfort Leonard at the Lewis School for Girls near the University of Mississippi. The founders sought to maintain high ideals and standards and to encourage intellectual growth and service to exemplify college women at their best. Since then, what began as an Anchor Club in Oxford, Mississippi has grown into a women's fraternity that boasts 149 collegiate chapters around the country. 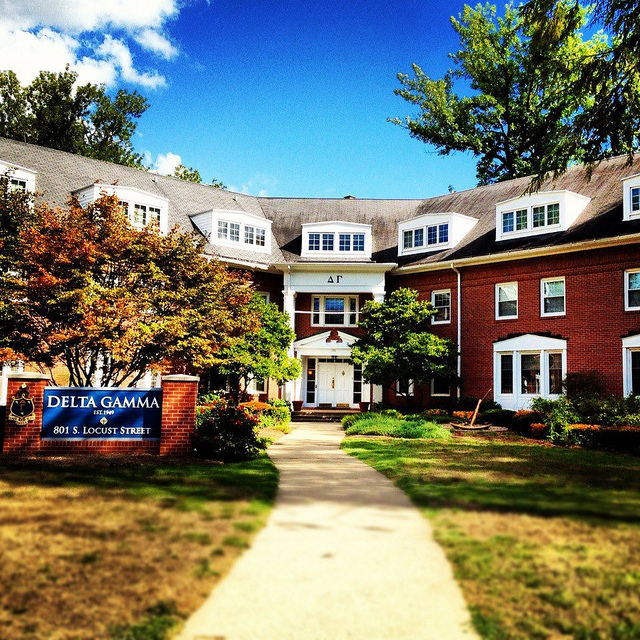 The Delta Iota chapter of Delta Gamma was chartered at DePauw University in 1949. Gamma Iota emphasizes sisterhood, service, involvement, and individuality among her members, and our women are bound together by a mutual sense of helpfulness. At DePauw, members of Delta Gamma participate in organizations across campus. Academically, DG is proud to have sisters in the Media Fellows, Science Research Fellows, and Honor Scholar Programs on campus. There are also members in the scholarship fraternity: Order of Omega. Athletically, Delta Gamma is represented on the DePauw Varsity Basketball, Softball and Track and Field teams. DG also has many sisters involved in DePauw's School of Music and Theater programs. Leadership development is also very important to Delta Gamma. Gamma Iota provides plenty of opportunities for members to assume leadership roles, and the lessons learned in the chapter translate to continued involvement outside of the house. Philanthropy is a crucial part of sorority life, and Delta Gamma prides itself on the spirit of volunteerism. More specifically, our members raise money for the Delta Gamma Foundation, which aids the blind and visually impaired through a program known as Service for Sight. Gamma Iota hosts annually Anchor Splash, a pool relay bash, to raise money for the foundation. The sisters of Gamma Iota chapter of Delta Gamma welcome you to DePauw University, and we look forward to sharing more about our sisterhood with you soon. Best of luck during recruitment!